Sigma DP2, ISO 50, f/5.0, 1/1000 sec. A lot of things vie for our kids’ time and interests, including but not limited to video games, which this post is not about. I could suggest why spending time outside with peers might be a better use of time than spending time playing video games, but that may not be the right battle to fight because (a) the short term reward systems that deepen addiction to video games may be more powerful than the long term benefits of participating in outdoor recreation as a social activity and (b) it’s a fight against the behemoth we all love to hate and hate to love called Organizational Marketing for Recruitment because of the perhaps misguided belief that Bigger is Better, at least in terms of Membership Numbers. These are all topics for another day, of course: back to the photo. The good fight to fight is that which spends money from the pocketbooks of youth parents wisely, and that which saves our kids from heavy loads on their backs. 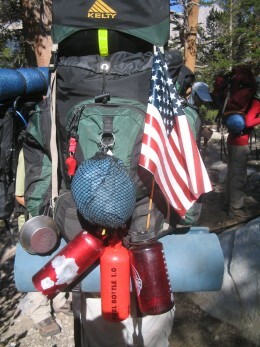 The pack in the photo is the prototype of a 2-lb pack we’re building for backpacking Scouts. It’s 65% lighter, absorbs 80% less water, and will cost 35% less than the most popular internal frame pack carried by Scouts new to backpacking, and parents new to buying gear for their Scouts that they don’t have to lug up and down the mountains. It’s intentionally been designed to be small enough so as not to fit all the gear that Scouts are told to carry these days by misinformed or inexperienced leaders and the risk management experts who review gear lists for high adventure programs. It has an internal frame so the Scout can carry several days of food, so even a 12-year old can go on a 50-miler. In the new BSA Guide “Passport to High Adventure”, wilderness backpacking is now recommended for kids aged 15 and older, an age guideline that has been creeping upward for the past 80 years. What a disaster, to rob younger kids of these experiences. The pack of course is only part of the problem, and a relatively minor one at that. The real battle, like that with video gaming, is about education. That’s why today, I’m joining a corps of six instructors from Backpacking Light to teach Scout leaders from across the U.S. in a sold-out wilderness course where they will learn how to implement lightweight backpacking programs in their own troops and high adventure programs, and why we are working with Montana BSA to provide High Adventure Treks that immerse Scouts into ultralight backpacking in a deep and meaningful way. What better proving ground to show that ultralight backpacking really does work, than the Bob Marshall Wilderness in May? The photo, of course, is my son Chase, 11 years old and 70 pounds soakin’ wet, carrying 13 pounds of food, personal gear (18.6% of his body weight, not 30%-40% as per BSA guidelines and 40%-50% which is common among Scouts), and patrol gear on a weekend trek near the snowline in March, in Montana, where we had temperatures down to 20 degrees and overnight winds gusting to 40 mph. My favorite part – he’s walking upright, gave away one of his trekking poles (“I don’t really need it, I suppose…”), and has a lot fewer things to keep track of than this Scout. Plus, he’s got a bit of a swagger to him on that high ridge. I like his confident gait – it’s fast, and intentional. He knows where he’s going! That doesn’t make Chase, or anyone who carries a light pack, a better person. But if better is defined as “more useful, suitable, or desirable” (freedictionary.com) then it would be hard to argue the case that you’ll have a better time in the wilderness if you saddle your kids with stuff that displaces the knowledge of skills that they should be carrying in their brains, and a little bit of emotional fortitude to do without a few things for a few days.